I remember year after year, at Christmastime, spending hours and hours making these cookies with my mom, and then eating so many of them! These are my all-time favorite cookies! They are probably the most time consuming to make, but the payoff is huge once you taste one :) Some cookies, once you've eaten a bunch of them, leave a sugary aftertaste in your mouth... like you need to brush your teeth or drink a glass of water or milk. However, these are not like that. The only way I can describe these, is that they have a "clean" taste to them. 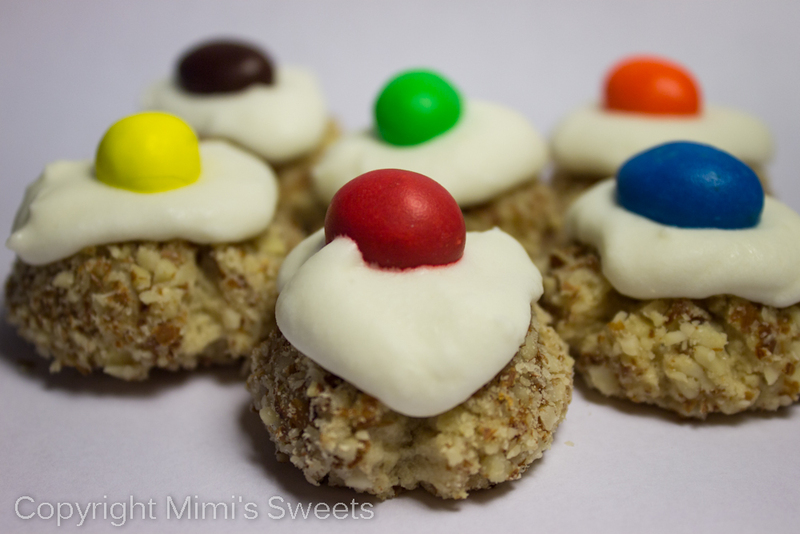 If you're wondering what this cookie is, it's a buttery cookie rolled in almonds and topped with a dollop of homemade cream cheese icing and a peanut M&M.